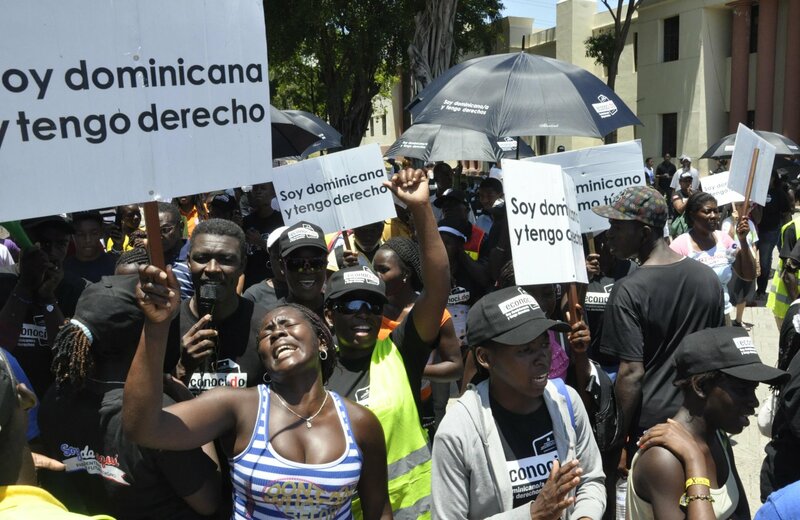 In case your attention has been elsewhere and you have not heard, on Wednesday, June 17, 2015, the Dominican Republic government began to legally process the looming mass deportation of thousands of migrant workers and their families whose citizenship status have not yet been regularized. This is the result of a 2013 Constitutional Tribunal ruling that stripped Dominican born children with Haitian immigrant parentage of their citizenship. This move to rid the DR of some of its Haitian population has been rightfully called an ethnic purging. It should be noted that there have always been Haitian elites well integrated in the socio-economy of the DR who remain unscathed by the persecution of their poorer compatriots. As Boston College professor Leigh Patel recently wrote, this is an attack on humanness from which we should not divert our attention. This cleansing, I would add, is a rejection of a certain kind of Black. Blackness that is too African. Despite our somatic plurality and the color gradations we encompass, Haiti and Haitians have always been portrayed and understood as that kind of Black. A Blackness of a particular kind that, truth be re-told, radically changed the world. It was an avant-garde Blackness that not only pulled off a successful slave revolution, which caused the disorder of all things colonial, but also brought the sanctity of whiteness into question. The Haitian Revolution disrupted the notion that Freedom (with a capital F) was the sole domain of whites or those close to whiteness. Indeed, the value ascribed to those Black Lives continue to deteriorate. Moreover, those among us who are visibly marked with that Blackness have had to continually dissuade folks that we are not genetically coded to be their property or the help. This is not limited to Haiti and is symptomatic of a greater Black Diaspora struggle as continuous state sanctioned and market driven violence on black bodies attest here and elsewhere. Being Black, these days, means living in constant state of siege. As Policy Director for @MillionHoodies, Pete Haviland-Eduah @TheNotoriousPHE noted on Twitter hours ago “We can’t swim, we can’t buy skittles, we can’t listen to loud music, we can’t shop, we can’t play, we can’t breathe, we can’t pray.” There are no safe spaces for that Black. Nine people were killed in their place of worship. An act of terrorism that must be named. Their killer sat in a pew for an hour before extinguishing their Black Lives. These stateside brutalities are not unrelated to what is happening in the Dominican Republic. We also know that Haiti’s present is full of international snafus, from the Red Cross’ epic fail to the UN’s refusal of accountability for the cholera epidemic, and underreported sexual exploitation of women and girls by UN peacekeepers. One need only look to the past for historical evidence that helps to explain the incessant exploitation and dehumanization, which is unfolding now. There are many, let me point to one. To be sure, anxieties about this tragedy in the Dominican Republic foster fears precisely given the complex history of these two nations that share an island. In the aftermath of the Trujillo ordered 1937 massacre (that killed well over 20,000 Haitians) reparations were sought by the Haitian President Stenio Vincent and U.S. President Franklin D. Roosevelt. Eventually, money exchanged hands. The initial value ascribed to the collective lives of the dead — $750,000, would later be reduced to $525,000 (U.S. $8,612,673.61 in 2015 dollars). As Eric Paul Roorda revealed in The Dictator Next Door (1998), in actuality the payment received by the Haitian government was a personal draft for $250,000 and $25,000 in palm oil. At the most, that would be under $15 per dead not including the palm oil. As the story goes, due to Haitian corruption, survivors received less than 2 cents. Now we know for certain Haitians do not hold a monopoly on corruption. Fortunately, not all Dominicans are on board with this legal deportation. Indeed, we also know and share a history of solidarity. In addition to a call to boycott the DR, efforts there and here are mobilizing to increase and keep awareness of the issue. Never in my professional life have I had a family member direct me to write. That’s why I cried. This is the same uncle who made me to do my homework everyday after school when I was growing up in Haiti. I would not be who I am today without his active presence in my life. He wanted me to use my voice and say something about what is happening. His nudge reminded me that this moment concerns us all. It is yet another brutal example of the devaluation of Black Lives to be added to a growing landfill of hashtags that spans the globe. We charge genocide again and again and again anywhere that Blackness is denied the right to peacefully live!!!! Just being should not be the full measure of our lived testimony. Those of us on this side of the water need to contemplate our distances and be particularly weary of geographies of empire that impede our potential unity. Come as you are, ain’t no fronting necessary. We need freedom fighters. There’s a Haitian Kreyòl word that you might want to add to your vocabulary. Rasanblaj. It means to assemble, to regroup, to gather.